YOU could sew when this is sleeping on your Christmas quilt! That would be Samosa, my birthday kitten. He is three months old today and is a bundle of fun. He likes to jump up an unsuspecting passersby leg -- luckily, the vet trimmed his claws! I made them using this tutorial from Deby at So Sew Easy. They are just right to contain a credit card (or Starbucks gift card!) and a lip balm. That one on the right is too small for a gift card. Because I put the tabs on the wrong side and they wound up inside the bag. When Deby says "place the tab on top of the zipper tape -- she means it. I cut off the ends and re-sewed it. Now it's too short. 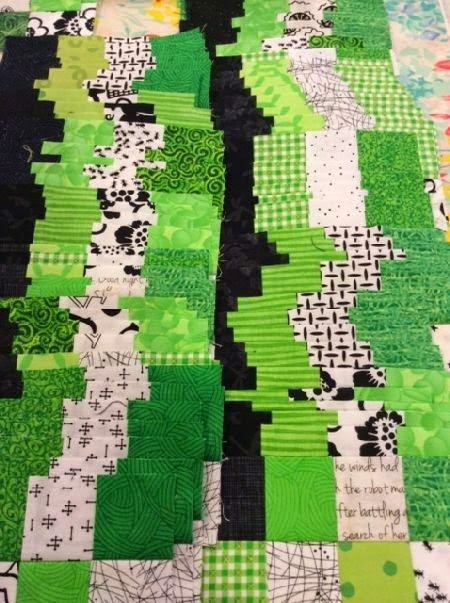 Are you sewing Bonnie Hunter's 2014 Mystery, Grand Illusion? I'm a sucker for a mystery project. And no, I don't have time for this. But who cares? With no boys at home this year, we're sort of ignoring Christmas. I set out a hurricane jar containing a candle and some glass scatters from Lillian Vernon. And that's it for Christmas decorations! Sure she will be delighted with it.Enjoy and have a great holiday season! 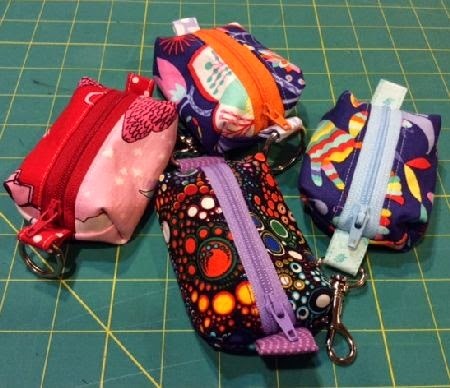 Those will be such nice gifts for those non sewing friends. 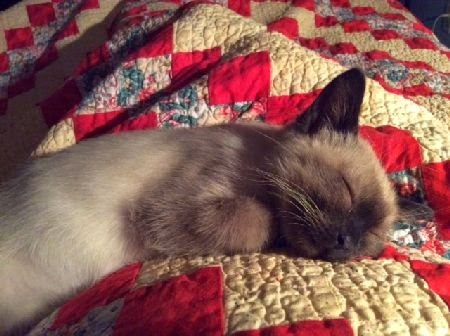 Little kitties play hard and sleep hard. Love your concession to decorating!!! those little pouches are so cute - a friend gave me one too for Christmas.. I think I've done even less decorating than you, I don't have even a Christmas tree up. All I have is Christmas cards I've received (which make me feel bad as I haven't gotten around to writing any this year!). I have a Christmas quilted wallhanging which I don't seem to be inspired to get out and hang up either - I mean how hard is that? That might have to be my goal for when I get home today. Get it out and get it on the wall! My stepdaughter's kitten is also named after food - Pesto. Is that because they are cute enough to eat? Merry Christmas Marti! I hope you had a nice day with your husband. I like your comment about believing you have friends that don't sew. I don't have many that do sew! Not a lot of women in their mid 30s have time for with work, young kids etc, or never properly learned how. I also live in a rural town so the population isn't big. I teach Home Ec though, and their seems to be a resurgence in the number of kids who want to create and make.